The Invention Of The Hot Water Heater Is A Blessing That Is Seldom Realized. You come to know its worth when you are in the middle of your bath or shower and the hot water suddenly stops coming through the shower! You might begin to think how a hot water heater works when you have to wash the dishes with the cold water because your heater isn’t working. Have you ever wondered which components are present inside the water heaters that play a role in heating the water? This article explains these heaters work because many people do not understand how their water heater works. Learning how a hot water heater works is not difficult. If you are curious and want to learn about the mechanism, you have come to the right place! 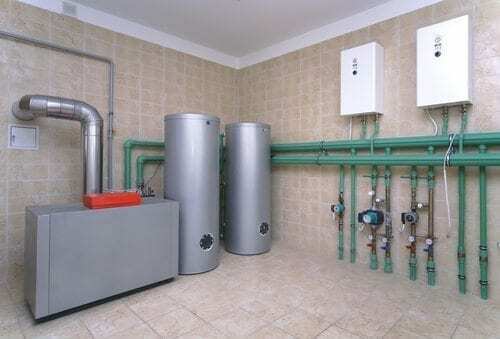 Let’s take a quick look at the parts and materials of a hot water heater. The tank is where all the water is collected for heating purposes. A regular sized water heater can hold 40 to 60 gallons of water. The water enters the tank through the dip tube at the top. From there, the water reaches to the bottom of the heater. This valve controls the flow of the water into the tanks and shuts off the water supply when the water tank is already full. Located at the top of the tank’s interior, it allows the heated water to travel to other pipes of a house. The thermostat regulates the temperature of the water heater. Some water heaters have a single thermostat while others have separate thermostats for different purposes. All the heaters work through a different mechanism to heat up the water. In the electrical one, a suspended electrical rod is used, and in the gas heater, natural gas and fire are used. This valve regulates the pressure inside the water tank. Too much pressure, and the tank will begin to leak. It is made of either aluminum or magnesium. It has a steel core that helps to prevent corrosion in the water tank. How a Hot Water Heater Works? The knowledge about the mechanism of the hot heater is important if you really want to know how your heater works. Before you look into the mechanism, you must know whether you are using an electric or a gas heater. Let’s see how a hot water heater works on electric and gas supply. Electrical heaters have a thermostat mounted on the inside of the tank. The thermostat keeps a check on the water temperature. When it senses that the temperature has fallen, it triggers a switch that allows the electricity to flow through the heating elements. When the temperature reaches the desired level, the thermostat turns off the power. In gas heaters, there are two sensors: a thermocouple that checks the gas lighting in the pilot setting and a thermostat that has a tube like a sensor with a mercury tip. When the thermostat senses that the water temperature has dropped down various degrees, it signals the gas valve. The gas valve then checks the thermocouple to ensure that the pilot light is burning. After ensuring the light, the gas value opens up the gas supply which burns and heats up the water. When the water becomes hot, the thermostat signals the gas valve to cut off the gas supply. Now that you’ve learned how a hot water heater works, you can fix minor problems on your own. The water heaters aren’t just limited to these two types. There are also tankless and solar water heaters as well. The former works by following a hot water recirculation system, and the latter follows a natural water circulation system that is heated by the sunlight. Before attempting to fix minor repairs on your water heater, you must know the type of heater you have. All in all, learning hot water heaters and how they work is also important because calling a plumber to fix minor problems can be costly, but with a little know-how of the water heater components, you can maintain the heater by yourself. Be cautious, though. You do not want to end up accidentally creating a bigger problem than you began with. Of course, if you have a tankless water heater, it would need a lot less maintenance and repair than the tank versions. The installation costs may be more than a tank water heater, but the long-term cost effectiveness outweighs this. Remember, if your hot water heater tank hasn’t been used in a while, it will have to be drained to avoid sepsis. No one wants to live with a septic water tank. Learn how to drain your hot water heater.